If you suffer from asthma or other illnesses affecting the lungs such as COPD or cystic fibrosis, your doctor may prescribe the use of a nebulizer. A nebulizer is an electric-powered device that converts liquid medication into a mist that can be inhaled normally. A nebulizer treatment is also called a breathing treatment. Understanding how a nebulizer works can help you manage your condition. The word nebulize means to reduce to a fine spray or mist, and that’s exactly what a nebulizer does. A nebulizer uses forced air or vibrations to turn liquid medicine into a fine mist. Nebulizers are often used in emergency departments to treat acute asthma attacks or other sudden breathing problems. Compact nebulizers and portable models are available for home use, and for some people, they are preferable to inhalers. Although conventional devices like metered dose inhalers and dry powder inhalers are generally preferred, they can present difficulties for some people -- especially young children or older people who have trouble with the coordination needed to dispense the medication, to time the inhalation just right, or to combine both steps quickly and effectively. For these individuals, nebulizers can be a viable alternative. Nebulizers emit a mist of medication that can be breathed in normally, over a period of minutes. Nebulized bronchodilators are used to help open the airways. Delivery of a single dose takes a bit longer with a nebulizer than with conventional devices, but nebulizers can be set up to deliver larger doses. There are several types of nebulizers, and some may be incompatible with certain medications. Your doctor may be specific about the kind of nebulizer you should use. Pneumatic jet nebulizers, the most commonly used in hospital settings, are produced for home use and are the least expensive and most popular. Newer designs are more efficient but cost more, and some raise concerns about patients getting too much of a drug. In general, the machines' electronics are durable and long-lasting, while accessories such as the power pack, tubing and face masks need to be replaced periodically. Jet nebulizers turn medication into mist using forced air. They are the most commonly used and least expensive, ranging from $50 to $150. Ultrasonic devices use sound waves and range in price from $100 to $250. They tend to heat the medication, though this doesn't affect most inhaled medications. Vibrating mesh nebulizers have a mesh plate that vibrates at a high frequency to break up the liquid into very fine drops. They cost from $200 to $1,200. Breath-actuated jet nebulizers release medication only when the user inhales, greatly boosting efficiency. They cost from $750 to $2,000. There are both tabletop nebulizers for home use and portable nebulizers that run on rechargeable batteries. Portable models are generally more expensive. 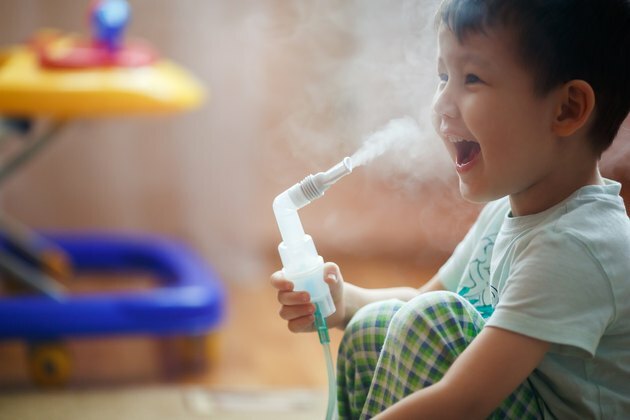 In addition to the component that actually nebulizes the medication, a nebulizer’s parts include a container to hold the medicine and plastic tubing that connects the container to a face mask or mouth piece. Treatments can be self-administered. Most nebulizers emit a constant stream of mist, which the user inhales deeply after four or five normal breaths. While taking the treatment, it’s a good idea to tap the nebulizer cup to ensure the medication is circulating through the system. Treatments normally last from 10 to 20 minutes. Clean your nebulizer to reduce the risk of contamination. More specific guidance on correct use is available in product labeling for nebulizers and package inserts for medications. Risks associated with medications are generally from the specific agents, not whether you use a conventional inhaler or a nebulizer. People with asthma should see a doctor at least once a year or more frequently, and as needed if symptoms do not improve or asthma control seems to be worsening. See your health-care provider right away if you're feeling faint, dizzy or weak. Seek emergency treatment or dial 911 if your lips or nails are turning blue, the wheezing gets worse 15 minutes or more after you've used a rescue inhaler, you are taking 30 breaths or more a minute, or have difficulty walking at a normal pace. What Are the Benefits of Nebulizers?